( Sanskrit: "Lord of Dance"), the Hindu god Siva (Shiva) in his form as the cosmic dancer, represented in metal or stone in most Saiva temples of South India. In the most common type of images, which includes the magnificent Cola bronzes of the 10th-11th century, Siva is shown with four arms and flying locks dancing on the figure of a dwarf, the Apasmarapurusa (a symbol of man's ignorance; purusa meaning "man," and apasmara "forgetfulness," or "heedlessness"). The back right hand of Siva holds the damaru (hourglass-shaped drum); the front right hand is in the abhaya-mudra (the "fear-not" gesture, made by holding the palm outward with fingers pointing up); the back left hand carries agni (fire) in a vessel or in the palm of the hand; and the front left hand is held across the chest in the gajahasta (elephant-trunk) pose, with wrist limp and fingers pointed downward toward the uplifted left foot. The locks of Siva's hair stand out in several strands and are interspersed with the figures of Ganga (the River Ganges personified as a goddess), flowers, a skull, and the crescent moon. 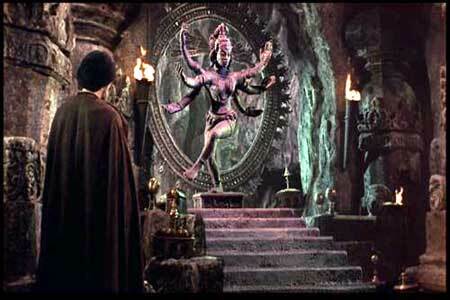 His figure is encircled by a ring of flames, the prabhamandala. This form of dance, which is the most common representation of Nataraja, is called in the classic Sanskrit treatises on dance the bhujangatrasa ("trembling of the snake"). 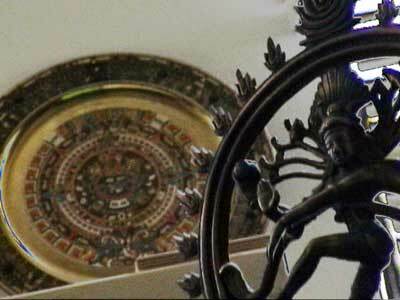 The significance of the Nataraja sculpture is said to be that Siva is shown as the source of all movement within the cosmos, represented by the arch of flames. The purpose of the dance is to release men from illusion, and the place where it is said to have been performed, Chidambaram, called the centre of the universe, is in reality within the heart. The gestures of the dance represent Siva's five activities (pañcakrtya): creation (symbolized by the drum), protection (by the "fear-not" pose of the hand), destruction (by the fire), embodiment (by the foot planted on the ground), and release (by the foot held aloft). Other dances of Siva seen in sculpture and painting are the wild tandava, which he performs on cremation grounds in the company of his consort Devi, and the evening dance performed on Mount Kailasa before the assembly of gods, some of whom accompany him on various instruments. The most common figures depict a four-armed Shiva. These multiple arms represent the four cardinal directions. Each hand either holds an object or makes a specific mudra (gesture). 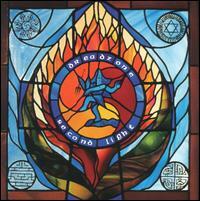 The upper right hand holds a hour-glass drum which is a symbol of creation. It is beating the pulse of the universe. 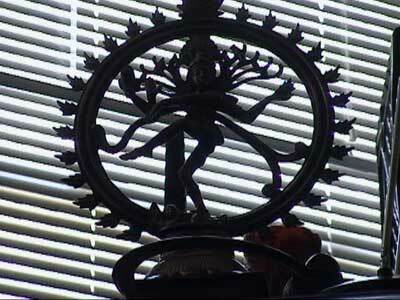 The drum also provides the music that accompanies Shiva's dance. It represents sound as the first element in an unfolding universe, for sound is the first and most pervasive of the elements. The story goes that when Shiva granted the boon of wisdom to the ignorant Panini (the great Sanskrit grammarian), the sound of the drum encapsulated the whole of Sanskrit grammar. The first verse of Panini's grammar is in fact called Shiva sutra. The second right hand is held in the abhaya pose (literally without fear) and so a gesture of protection, as an open palm is most likely to be interpreted. It depicts the god as a protector. The left leg is raised towards the right leg and reaches across it; the lower left hand is stretched across the body and points to the upraised left foot which represents release from the cycle of birth and death. Interestingly, the hand pointing to the uplifted foot is held in a pose imitative of the outstretched trunk of an elephant. In Sanskrit this is known as the 'gaja-hasta-mudra' (the posture of the elephant trunk), and is symbolic of Ganesha, Shiva's son, the Remover of obstacles. Shiva dances on the body of a dwarf apasmara-purusha (the man of forgetfulness) who embodies indifference, ignorance and laziness. Creation, indeed all creative energy is possible only when the weight of inertia (the tamasic darkness of the universe) is overcome and suppressed. 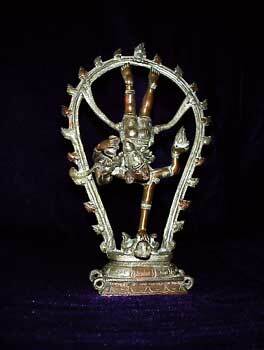 The Nataraja image thus addresses each individual to overcome complacency and get his or her own act together. 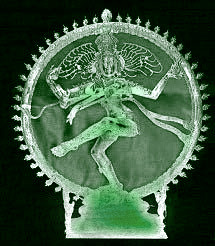 The Nataraja image is also eloquent of the paradox of Eternity and Time. It shows us that the reposeful ocean and the racing stream are not finally distinct. This wonderful lesson can be read in the significant contrast of the incessant, triumphant motion of the swaying limbs to the balance of the and the immobility of the mask-like countenance. 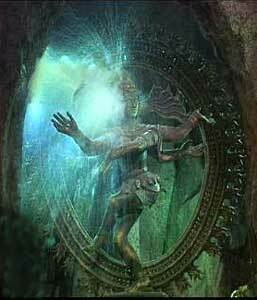 Shiva is Kala, meaning time, but he is also Maha Kala, meaning "Great Time" or eternity. As Nataraja, King of dancers, his gestures, wild and full of grace, precipitate the cosmic illusion; his flying arms and legs and the swaying of his torso produce the continuous creation-destruction of the universe, death exactly balancing birth. The choreography is the whirligig of time. History and its ruins, the explosion of suns, are flashes from the tireless swinging sequence of the gestures. In the beautiful cast metal figurines, not merely a single phase or movement, but the entirety of this cosmic dance is miraculously rendered. The cyclic rhythm, flowing on and on in the unstable, irreversible round of the Mahayugas, or Great Eons, is marked by the beating and stamping of the Master's heels. But the face remains, meanwhile in sovereign calm. party _Cosmic Dance Of Shiva_ at The Collonade summer 1995, Hollywood, CA.